Satirical News: Shippaiman Episode Eight "One Week Traffic" Further Offends Joseph Pabaya! Not satisfied with just tackling the MRT Issue, episode writer Yoshio Urasawa now presents the issue with traffic. Super Sentai senior actor Yuji Kishi plays as a guest star in this episode. He's the dumped off transportation minister of Japan. Yoshihiro Fukoda resumes his role as Joben Abunami in this episode. Kishi's character Kyousuke Kishi was fired by the incompetent prime minister for criticizing the latest scheme. After his dismissal, Abumani kept telling the Japanese people that traffic is not fatal. Worse, Prime Minister Nobita lies to the Japanese people it's a sign of progress. No thanks to the mismanagement, Tokyo gets stuck in a one week traffic jam. The Winsbraindraft start to analyze Joben's claims and layouts to "fix traffic". They discovered that trains in Japan were reduced to such a small number and that poor traffic enforcement has made Japan a country of traffic violators. The problem soon results to Japan's economic activities getting halted no thanks to heavy traffic. All the while, Shippaiman and Noopaiwoman are trying to "assure" everyone that the heavy traffic is indeed a sign of progress. Captain Masaki and Kyousuke develops a new robot called Traffic Droid to try and direct traffic to solve the traffic crisis. Both Takeru and Jules start to rescue those stranded in traffic before anyone could die as a result of hypertension. When the Traffic Droid starts to maneuver traffic and punish violators by getting them out of the road and caging them, the traffic starts to get solved. The Prime Minister then starts to issue another word that fixed traffic is a sign of economic downfall. 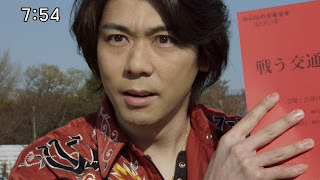 But Takeru and Jules manage to present the facts which causes them to turn against both Shippaiman and Noopaiwoman. The end of the episode has the traffic fixed causing the Prime Minister to try and grab credit for it. But angry Japanese throw rocks at him knowing he's outlawed Winsbraindraft. The whole show caused Joseph Pabaya to be further infuriated. After seeing the Shippaiman episode, he laments that Nobita Aquino is no longer in power.